The most recent maintenance release of IBM AIX 5L Version 5.3 includes a significant set of new features added to the NFSv4 implementation. In 2004, the first IBM Redbooks publication devoted to the topic of NFSv4 implementation in AIX 5L was published: "Securing NFS in AIX: An Introduction to NFS V4 in AIX 5L," SG24-7204. This book provides additional up-to-date information to help IBM clients understand and take advantage of the new NFSv4 functions provided by AIX 5L Version 5.3 with the 5300-03 Recommended Maintenance Package. The NFSv4 implementation in AIX 5L has now expanded to provide core features that make it capable of providing a much broader range of distributed file system services than any prior version of NFS. 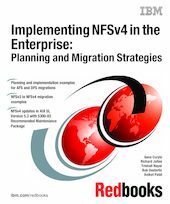 The scope of this book includes methods for implementing NFSv4 in the enterprise and extensive coverage of methods for how it can potentially be used as a migration target for existing AFS-based and DCE/DFS-based enterprise file systems.